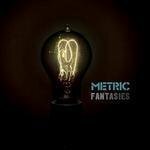 Emily Haines’ heart is beating like a hammer – as she sings on Help I’m Alive – and so is Metric’s fourth full-length album, Fantasies. So cohesive and deliberate is this album from start to finish, it seems like a record that, by design, made itself. As its namesake suggests, it’s a dreamscape of neon and methodized noise that scratches at the real, the sensorial, and the downright hallucinatory, and it’s all channeled into a big She-Ra sword brandished by Haines herself. The Toronto native inhabits a certain intelligent beauty – her face can appear both stern and forgiving, like a sandy-haired Carrie-Anne Moss. This wisdom can be heard as well as seen, and it drives Fantasies through all ten tracks. For an album that sounds like the Breeders caught in an electrical storm, Fantasies had a more rustic beginning. In a very Bron-Yr-Aurian move, the band met in the woods outside Seattle to work on acoustic songs. Those of you who have seen Metric’s throbbing, supercharged live shows know those songs wouldn’t stay acoustic for long, however. The band has historically found its electrical conductor in skyscrapers – they love the big city, whether it be Toronto, New York, or London. Whatever process the songs went through in their incubation, they are now as fast-moving and impulsive as the cities the band uses as bases, gleaming a pop star gleam and yet snarling like a seasoned rocker. Credit guitarist James Shaw for having the chops to match Haines’ pop sensibilities with just the right imposing might. Fantasies is filled with daydream imagery and blurred bright lights. “I’m higher than high/Lower than deep”, Haines sings on Twilight Galaxy. She sounds like someone in a blissful haze before the sobering fury of Gold Guns Girls, a song that sees Haines at her most fierce and demanding. But the album really earns its name on closer Stadium Love, which is a real bungle in the deathmatch jungle that depicts no less than the animal kingdom facing off in some crazy, soon-to-be-reality-TV-show spectator sport. What will really bring listeners back to this album, though, is the music, which is the most consistently sustaining energy the band has ever created. Help I’m Alive, Satellite Mind and Gold Guns Girls are all piercing in their sonic absorption, and this momentum maintains itself like a plucked string that won’t stop vibrating. This isn’t the breakthrough album that nobody expected. This is precisely the album everyone was waiting for from Metric, a culmination of all their strengths and a slicing off of the fat that may have slowed them down in the past. It’s a collective effort, but more so it is a singular idea; Fantasies lives and breathes through Haines, her words pushing through its capillaries and her breaths flexing its diaphragm. And, of course, her heart hammers away – the perfect rhythm to dance to.